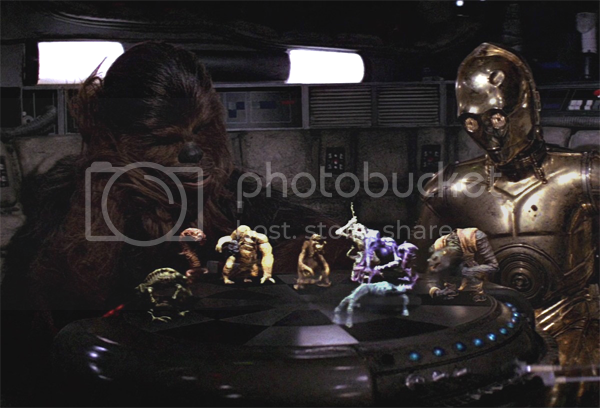 In celebration of the new Star Wars film coming out later this month, why not partake in a game or two of interstellar holo-chess? Once again my rules are based off of the official rules for the game, with a minor change or two to make the game easier to host on VGF. The board is divided into three concentric circles, called orbits. The central circle is always white. The outer orbits are divided into twelve equal segments, known as rays, which are colored alternately black and white. There are two power pieces The Bros, Mario and Luigi. These pieces have high ratings in all three capabilities. Mario has the ratings of Attack 6, Defense 5, Movement 3. Luigi has the ratings of Attack 6, Defense 6, Movement 2. Besides this, there are two mid pieces The Small Guys, Toad and Koopa Troopa, which have mid-range ratings in all three capabilities. Toad has the ratings of Attack 4, Defense 3, Movement 2. Koopa Troopa has the ratings of Attack 4, Defense 4, Movement 1. After these, there are two defensive pieces The Dragon and The Lady, Yoshi and the Princess, which have high defense ratings and low attack ratings. The Princess has the ratings of Attack 3, Defense 8, Movement 1. Yoshi has the ratings of Attack 2, Defense 7, Movement 3. Finally, there are two offensive pieces The Showdown, Bowser and Donkey Kong Jr., which have high attack ratings and low defense ratings. Donkey Kong Jr. has the ratings of Attack 7, Defense 3, Movement 2. Bowser has the ratings of Attack 8, Defense 2, Movement 2. The objective of Dejarik is to destroy all of your enemy's pieces before s/he can destroy all of yours. If you want to play the game, just sign up in this thread. If two people are already playing, I can put you on a waitlist for the next game. At the beginning of the game, I will randomly divide the pieces between the players, and place them on opposite sides of the board. With each new game a player may have different pieces on his or her side, so it is important to know the capabilities of each playing piece. During each turn, a player is allowed to take two consecutive actions, which can be used to either move one of his or her pieces to a new space, or to attack an opponent’s piece. (So, during a turn, a player may move a piece twice, or may attack two other pieces, or move and then attack, or attack and then move.) However, a player must use both of his or her allotted actions each turn. Moving: When moving a piece across the game board, the piece must be moved its full amount of spaces designated by its movement rating. For example, when moving Yoshi, the player must move the piece 3 spaces, and may not move it only 2 or 1 in order to place it in a more favorable position. When moving, a piece may move to any space adjacent to its own (either around the orbit or along the ray) but cannot move diagonally, or into a space occupied by another piece. Attacking: If a player has positioned one of his or her pieces adjacent to an opposing piece (assuming he or she has an action remaining that turn), the player may declare an attack on that piece. The results of the attack are calculated by me, using the piece’s attack rating versus the opposing piece’s defense rating. Essentially, a number of six-sided dice are rolled equal to the attacking piece's attack rating and the defending piece's defense rating, and then the two numbers are compared. Thus, if Luigi attacked Koopa Troopa, 6d6 would be rolled for Luigi while 4d6 would be rolled for Koopa Troopa. If the attack roll beats the defense roll by 7 or more, the player’s piece will destroy the opponent’s. This is appropriately known as a "kill". Once killed, the opponent’s piece is removed from the board, but the attack piece remains in its present space. If the attack roll beats the defense roll by 6 or less, the player’s piece will "push" its opponent’s piece. Strategically, pushing is one of the most important parts of the game. In a push, the attacker "pushes" his or her opponent’s piece to any open adjacent space, either to block other pieces, to set the piece up for an easy kill, or to simply get it out of the way. If the attack roll and the defense roll are equal, or if the defense roll beats the attack roll by 6 or less, the opponent’s piece will "counter-push" the attacking piece. This works the same way as a push, except hat the opponent is now pushing the attacking piece into an open adjacent space. If the defense roll beats the attack roll by 7 or more, the opponent’s piece will destroy the attacking piece. This is known as a "counter-kill", and can often change the strategy of the entire match. To-The-Death: If each player only has one piece remaining on the board, a final confrontation occurs. The two pieces move to the center of the board, and battle To-The-Death. Each piece uses its highest rating (be it Attack or Defense) to determine the outcome. If the first round does not result in a kill, then the same process is repeated, until only one is left standing. This player has won the game. Also, try to reply to the thread in a timely manner just to keep the game going. If you decide you don't want to play anymore, you can give your seat up to someone else. Ah, I remember playing this here. It was pretty fun the first time, so I'd love to go again if no one else wants to give it a go. Anyone else want to give it a go? It's a galaxy of fun.